Ireland is divided into four provinces, which incorporates Northern Ireland as well as the Republic. 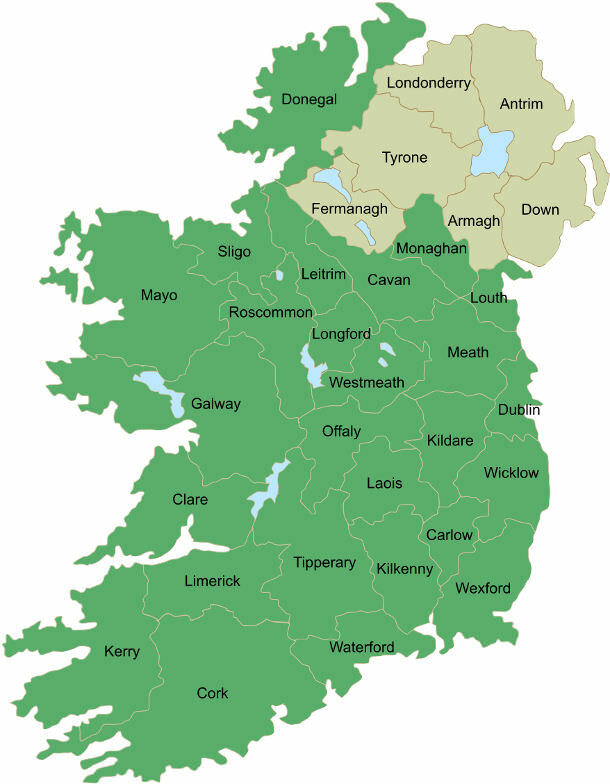 The Republic of Ireland is further divided into 26 counties. Each county has its own rich history and local attractions, but all of them have that postcard green Irish scenery that makes Ireland an ideal wedding destination. This rural county filled with mountains, river valleys and countryside is home to three of Ireland’s key national walking routes. It is situated in the south-east of the country, just over an hour’s drive from Dublin. Carlow is a perfect destination for lovers of golf, water activities and walking and you can find more information on www.carlowtourism.com. The county has a number of wedding venue options, from castles to hotels to gardens. Some popular wedding venues include Mount Wolseley Hotel and Spa (www.mountwolseley.ie), Huntington Castle and Gardens (www.huntingtoncastle.com) and Stephen House Hotel (www.stephousehotel.ie). This fertile farming county, characterised by lakes and hills, is situated in the border region of Ireland. There are many great wedding venues in Cavan, all with stunning backdrops of the hilly landscape. For a romantic, stately wedding, Farnham Estate has http://www.farnhamestate.ie/luxury-wedding-venue. Or if you would like a fairy-tale wedding, visit www.cabracastle.com to find out about the wedding packages at the 19th century Cabra Castle set in 100 acres of gardens and parklands. Restaurants in Cavan are among some of the highest rated in the country, including MacNean House (www.nevenmaguire.com) owned by celebrity chef, Neven Maguire, which is in northern Cavan. Clare is one of the most magical and wild counties in Ireland, with breath-taking sea cliffs and a rocky national park. The famous Cliffs of Moher that stretch along the west coast of Ireland are at their best in Clare with the wild Atlantic Ocean crashing up against them. Visit www.cliffsofmoher.ie for directions and information. Inland from the rugged coastline is the Burren National Park, which is covered in an exposed natural limestone pavement and is a great place to explore on foot (www.burrennationalpark.ie). If you’re looking to get married in this classic Irish county, one fairy-tale option is the beautiful centuries-old Dromoland Castle – find out more about their wedding services at www.dromoland.ie. Clare is a two-and-a-half to three-hour drive from Dublin, however there is an international airport in the county. See www.shannonairport.ie for details. Cork, nicknamed the Rebel County, is in the south of Ireland set in rolling green countryside. It is home to the second largest city in the country after Dublin and has many historical attractions. While you’re there, be sure to kiss the Blarney Stone in order to receive the ‘gift of the gab’ at Blarney Castle (www.blarneycastle.ie). For a luxury wedding in the southern county, you could consider the picturesque little Fota Island, complete with its own resort and zoo! Find out more about the resort’s five-star wedding options at www.fotaisland.ie/Fota-Island-Weddings. Or for a romantic garden setting, have a look at Ballyvolane House in the north of the county (www.ballyvolanehouse.ie/weddings/). Imagine winding country roads, sea cliffs, hills, mountains, valleys and sheep. That is Donegal, the wild and rugged county in the far north-west of Ireland. It is a very rural region with many areas that do not have phone reception, but that adds to the Irish charm and adventure. Just be sure to bring a map with you! There are a number of hotels and wedding venues that incorporate the magnificent scenery of Donegal into their ceremonies. Lough Eske Castle Hotel and Spa is the perfect setting for a beautiful wedding, with the striking castle, picturesque gardens, a large lake and surrounding forests. Visit www.solishotels.com/lougheskecastle for more information. But be aware if you’re planning a wedding in Donegal, it can be very windy! Ireland’s capital city has plenty to do and see, from the Guinness Factory to Trinity College to cosy pubs and restaurants. For some traditional Irish music and local buskers, head to Temple Bar, a cobblestone pedestrian street full of restaurants and pubs (www.templebar.ie). Or learn about the city’s history on a relaxing Liffey River Cruise, which takes you on a journey through the heart of Dublin (www.liffeyrivercruises.com). The Shelbourne Dublin - A classic-come-contemporary hotel on St. Stephen’s Green, a sought-after location in Dublin. Go to www.shelbourneweddings.ie for more information. Maples House - This small family-run hotel is a classic wedding venue, with a dedicated wedding co-ordinator and friendly staff. Visit www.mapleshotel.com to find out more. The west is the best according to locals and it’s hard to disagree with them when you wander along the main street of Galway City. Buzzing with live traditional music and cosy bars, Galway is a popular destination for tourists looking for some good old Irish ‘craic’. But there’s a lot more to the county than its capital city, including the famous Connemara region, which looks like something out of Middle Earth. And if you like the idea of getting married amid the mountainous scenery, there are a number of wedding venues to choose from. Rosleague Manor rests on the shores of Ballinakill Bay in Connemara and incorporates 30 acres of private woods. To find out about its wedding packages, visit www.rosleague.com. Delphi Mountain Resort is set in a spectacular valley of Connemara and offers unique wedding packages (www.delphimountainresort.com). Nicknamed ‘The Kingdom’ and referred to as ‘the playground of Ireland’, Kerry is home to many natural tourist attractions. The Killarney National Park is the perfect place for walks, cycling and horseback riding and you are almost sure to see native deer, birds and if you’re lucky, a fox or badger! The south-west county has mountains, beaches and town centres with plenty of choice for wedding settings. From championship golf courses to adventure centres and resorts, there are wedding venues to suit all tastes. The Kenmare Bay Hotel and Resort can cater for up to 350 guests and has spectacular views of the Kerry Mountains. Visit www.kenmarebayhotel.com for more information. Or for an idyllic setting and a wedding uniquely designed for each couple, have a look at Aghadoe Heights five-star Hotel and Spa (www.aghadoeheights.com). Kildare is a picturesque county bordering Dublin with many grand estates and hotels. It is the equestrian capital of Ireland, home to the National Stud Farm, where you can visit beautiful thoroughbreds and Japanese Gardens (www.irishnationalstud.ie). The stunning Killashee House Hotel is set in 280 acres of historic gardens, which make stunning wedding backdrops. Find out about its wedding packages at www.killasheehouse.ie. Or for a storybook enchanted wedding, have a look at the Village at Lyons on the Grand Canal less than 20 minutes from Dublin (www.villageatlyons.com). This inland county is full of culture, with a thriving comedy, festivals, music and arts scene, and of course, world-famous beer! The annual calendar of events in the ‘Marble County’ includes coedy, summer festivals and craft and food fairs. Ballyduff House, an elegant Georgian country house, is a perfect wedding venue that has a ‘homely’ feel as well as a bit of luxury and charm. Visit www.ballyduffhouse.ie for more information. The River Court Hotel rests on the banks of the River Nore, offering a superb backdrop for a wedding (www.rivercourthotel.com). Situated in the heart of Ireland, this midland county is very rural and scenic and just one-hour from Dublin City. It is relatively flat compared to most of Ireland, except for the ancient Slieve Bloom Mountains, which have beautiful forests, rivers and waterfalls to explore on foot or bicycle (www.slievebloom.ie). Castle Durrow, located in the little rural village of Durrow, is one of the country’s most luxurious wedding venues. To have a look at photos and find out about wedding packages, visit www.castledurrow.com. And for one of the most exclusive weddings in Ireland, if your budget allows it, check out Ballyfin, a private and elite demesne that offers the best in gourmet food and luxury vacationing (www.ballyfin.com). This unspoilt region nicknamed the ‘Wild Rose County’ is the perfect Irish location to relax and enjoy the scenery. Home to rivers and lakes, waterside pubs and restaurants and the River Shannon, it is a great place for angling and cruises. Lough Rynn castle is an historic Irish castle on the shores of Lough Rynn, surrounded by 350 acres of ancient forests and green pastures. The secluded castle is a magnificent wedding venue and has a state-of-the-art online wedding planning service, perfect for couples organising their wedding from overseas (www.loughrynn.ie). For a luxurious and charming, but more low-key wedding, visit the Landmark Hotel Leitrim in the riverside town of Carrick-On-Shannon. Go to www.landmarkhotel.com for details. This romantic and poetic county is steeped in history and is home to Ireland’s third-largest city. If you are planning an intimate and whimsical wedding, then this could be the perfect destination for you. Be sure to have a limerick prepared for the vows though! Adare Manor Hotel and Golf Resort is among the most stunning wedding venues in the country and has everything from the remarkable old building to lush gardens to its fairy-tale arched bridge. Visit www.adaremanor.com to find out more. Also in the quaint village of Adare, where you will find the largest group of thatched-roof houses in Ireland, is the Woodlands Hotel, a family-run hotel perfect for enchanting weddings (www.woodlands-hotel.ie). Longford is a rural and tranquil county situated in the heart of Ireland’s lake region. Rich with ancient Irish mythology and historic sites, it is a relaxing and interesting part of the country. Because it is a rural county, there is not a huge array of wedding venues to choose from, but the hotels that are there make the most of the stunning countryside. Viewmount is an elegant Georgian House set in four acres of gardens. Exclusive use of the entire house and grounds is available for weddings and you can find out more at www.viewmounthouse.com. For a slightly less rural celebration, Longford Arms Hotel is set right in the heart of Longford Town amid restaurants, bars and local attractions (www.longfordarms.ie). A short 20-minute drive from Dublin airport, Louth is a county full of history, folklore and historic sites as well as long sandy beaches. There are also vibrant towns and communities in Louth and plenty of choices for wedding themes. Ballymascanlon House Hotel has a huge 130 acres of charming parklands and mature gardens offering beautiful wedding backdrops. Visit www.weddings.ballymascanlon.com for more information. If you are looking for a castle setting for your wedding close to Dublin, Darver Castle is a perfect option set in 50 acres of parklands, lawns and gardens. Find out more at www.darvercastle.ie. This western county is rugged and diverse, with jagged peninsulas, estuaries, mountains and boglands. It is best known for its golf courses, fishing and hiking trails, as well as fantastic local live music at bars and pubs in the towns and villages dotted across the county. For a fairy-tale wedding in Mayo, have a look at Mount Falcon, one of the west’s leading wedding venues (www.mountfalcon.com/wedding-hotel-mayo). Or for a beautiful beach wedding, you can consider Mulranny Park Hotel, which is perched on a hill overlooking the stunning west coast sand and sea with views of Clew Bay and its 365 islands www.mulrannyparkhotel.ie/weddings-hotel-mayo). The ‘heritage capital’ of the country, also nicknamed the ‘Royal County’ was once the territory of the High Kinds of Ireland. Meath is home to the UNESCO World Heritage Site, Newgrange, an ancient relic built during the Neolothic or New Stone Age by a local farming community. It was constructed more than 5000 years ago making it older than Stonehenge and the Great Pyramid of Giza. Find out more at www.newgrange.com. To keep with the royal theme of Meath, you can consider a wedding at Slane Castle, which has a one-day exclusive rental policy. Set in 1,500 acres in the heart of the Boyne River Valley, it is only 25 minutes from Dublin airport (www.slanecastle.ie). Complete with unspoiled landscape, an abundance of wildlife and beautiful green Irish scenery, County Monaghan is a perfect destination for lovers of the outdoors. Some popular activities for visitors include fishing, walking, cycling, horseback riding and golf, but there are also plenty of indoor events, including poetry, lace making and live music. Castle Leslie Estate is an idyllic Monaghan wedding destination, with 1000 acres of countryside, ancient woodlands and glistening lakes. Visit www.castleleslie.com to plan your special day. For an equally romantic but more low-key affair, the Westenra Arms Hotel offers a warm, homely atmosphere for intimate weddings. You can find out more about the family-run hotel at www.westenrahotel.com. Home of US President Barack Obama’s ancestors as well as the world-famous Tullamore Dew, Offaly has quite a lot to offer for a small rural county in the centre of Ireland. You can hike or cycle through the ancient Slieve Bloom Mountains, hire a barge and cruise along the Grand Canal or go whiskey tasting at the Tullamore Dew Visitor Centre (www.tullamoredew.com). Heading south of Tullamore, you will find President Obama’s ancestral home in the little rural village of Moneygall (www.moneygall.com). There are a few nice four-star hotels that offer romantic wedding packages in Offaly, including the Bridge House Hotel (www.tullamore-weddings.bridgehouse.com) and the Court Hotel (www.tullamorecourthotel.ie/en/offaly-weddings), which are both in the county’s capital of Tullamore. Or for a rural castle wedding, the heritage town of Birr has a large castle demesne, which offers intimate ceremonies in the Pavilion (www.birrcastle.com). Roscommon is one of the most rural counties in Ireland, with agriculture its main industry. Oddly nicknamed ‘The Sheep Stealing County’, you will get a true sense of quaint Irish country life. The landlocked county is home to the longest stretch of the River Shannon as well as the fascinating tourist trail called the Arigna Miners Way, which follows the historic path used by miners (www.arignaminingexperience.ie). Roscommon has some charming wedding venues to offer, including Abbey Hotel, an 18th century manor house castle hotel with private grounds and gardens. Visit www.abbeyhotel.ie for more information. Sligo is situated in the north-west of Ireland and is strongly associated with the famous poet W.B. Yeats as well as his brother, the artist Jack B. Yeats. The county is dotted with monuments stretching back 5000 years, including Carrowmore, the largest megalithic cemetery in Ireland. There are a number of other attractions including the country’s largest sanctuary for birds of prey and owls and the Sligo Folk Park, which showcases Irish heritage based on a traditional cottage farm. Cromleach Lodge is a luxury country house hotel and Ciúnas spa in Sligo near Roscommon and Leitrim. For wedding enquiries, visit www.cromleach.com/weddings. On Sligo’s coast overlooking Killala Bay, the Diamond Coast Wedding Hotel is a luxury venue and is close to the beach, perfect for those beautiful wedding photos (www.diamondcoast.ie). Tipperary is an inland region with historic sites, unspoilt walking trails, rolling hills and beautiful rural landscape. There is a relaxed atmosphere in the county but it’s certainly not a boring place to visit, with quirky festivals, challenging golf courses and horse racing. Coolbawn Quay is a lakeshore spa and marina and an ideal wedding venue. The private village resort is bordered by forests and green hills. Visit www.coolbawnquay.com for more information. Nestled in 200 acres of Irish countryside, Dundrum House Hotel is another beautiful wedding venue in Tipperary and features both old world charm and modern luxuries (www.dundrumhousehotel.com). Situated in the sunny South-East, Waterford City, the county capital, is Ireland’s oldest city and is buzzing with arts, golf, watersports, equestrian and angling. It is also home to Waterford Crystal, which has a beautiful visitor centre in the city (www.waterfordvisitorcentre.com). The county boasts 49 beaches along nearly 150 kilometres of prime coastline, as well as river valleys, lakes and mountains. Faithleg House Hotel and Golf Course is a perfect wedding venue in Waterford. Find out more about the 18th century mansion at www.faithlegg.com. This inland county has the two largest towns in the Irish midlands and is home to attractive lakes and waterways as well as historic tourist attractions. They include the ancient monastery of Fore Abbey (https://www.weswap.com/blog/local-insights/exotic-locations-around-world/#fore) and Belvedere House, Gardens and Park (www.belvedere-house.ie). For a romantic wedding near the large but charming Westmeath town of Athlone, have a look at Glasson Country House Hotel. It offers panoramic lakeside views of Lough Ree and includes a championship golf course. Find out more at www.glassongolfhotel.ie. Mount Druid is an alternative wedding venue set in peaceful surrounds including parklands and a lake. The venue caters to boutique wedding receptions and ceremonies with your own personal touch (www.alternativeweddings.ie). Wexford is situated in the south-east corner of Ireland and has a number of major attractions including a National Heritage Park at Ferrycarrig, which delves into Irish history from 7000BC to the arrival of the Normans in the 12th century. The coastal county has kilometres of beaches, award-winning golf courses and great fishing spots. Marlfield House is a majestic wedding venue in Wexford. It is set in acres of gardens and woodlands and offers an exclusive and unique setting (www.marlfieldhouse.com). For a luxurious red-carpet wedding, Ferrycarrig Hotel provides deluxe wedding services with sweeping views across the Slaney River. Visit www.ferrycarrighotel.ie for more information. This mountainous county is one of the most popular tourist destinations in Ireland and it’s not hard to see why. Nicknamed the “Garden County”, Wicklow has a number of world famous sites and attractions. It is close to Dublin and is a nature-lover’s paradise with kayaking, abseiling, power-boating and hill climbing among other adventure activities. Ballybeg House is a tranquil, romantic setting for a wedding, featuring some of Ireland’s oldest oak and beech trees. It is a perfect country setting, with horses, cows and sheep grazing in the fields, beautiful gardens and views over Croghan Valley. Find out more about the wedding packages available at www.ballybeg.ie. For a resort-style wedding, have a look at Druids Glen, which also makes the most of the breath-taking Wicklow views. It is an exclusive wedding venue in a secluded location (www.druidsglenresort.com). Find out more about getting married in Ireland in our Republic of Ireland Wedding Guide or browse our Irish Wedding Directory to start planning your dream wedding.